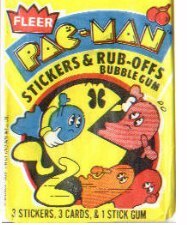 In 1982, Fleer joined the Pac-Man craze by coming up with some cool bubble gum card packs. 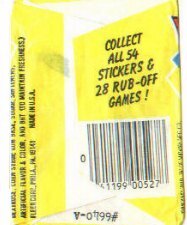 Each pack sold for a suggested retail price of 30 cents, and it contained three stickers, three rub-off maze games, and one stick of traditional Fleer bubble gum. 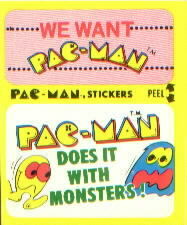 The cards were so popular that they reprinted them later that year, and they enhanced the appearence of the stickers when they did (see differences). 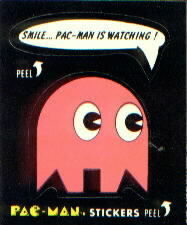 Next, they issued Ms. Pac-Man Stickers and Ruboffs (a few months later, I believe). They must have printed those at least twice, too, because there are at least two subtly different versions in existence. 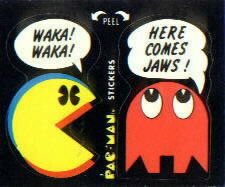 Finally, they released Super Pac-Man Stickers and Ruboffs, and later (1984?) they released Dragon's Lair Stickers and Ruboffs. The video craze had died down by then, however, and so had the "stickers and rub-offs" concept, so these later cards are quite rare. 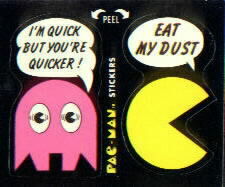 Each of the Pac-Man and Ms. Pac-Man sticker sets had a total of 54 stickers that you could collect. I don't know how many are in the Super Pac-Man set because the wrapper and all the sticker backs say "Design-Your-Own Pac-Man Poster Contest" instead. It's not necessarily 54, though, because there are 63 Dragon's Lair stickers. That's about all I need to say for now... the stickers basically speak for themselves! Click on a set below to enjoy. Eventually I'd like to have each complete set represented, but for now I have a representative sample of each.